With the possible exceptions of Ed Wynn and Fred Allen, no vaudeville comedy act ever attracted more highbrow approval than the Marx Brothers. Alexander Woolcott, Salvador Dali, and James Agee numbered among their enthusiasts. In reality, they pretty much scored a hit with everybody regardless of brow height. Whether consciously or unconsciously, over the years they managed to cook up an act that encompassed all the comedy genres currently in vogue. They had a first rate pantomimist (Harpo), a top-notch dialect comedian (Chico), a “talker” (Groucho) and a romantic light comedian (successively Gummo and Zeppo). They were as good therefore as four acts in one, combining the appeal of Charlie Chaplin, Weber & Fields, Milton Berle and, well, Zeppo, all in one act. W.C. Fields called them “the one act I could never follow”. As astoundingly talented as they were and as natural as they were together, the most perfect act in show business didn’t just happen overnight. The act evolved over 15 long years in vaudeville, through trial and error, almost like a scientific experiment — R & D. their beginnings were mundane enough. Behind the make-up, they were Leonard, or Leo (“Chico”, 1887-1961), Adolph, or Arthur (“Harpo” 1888-1964), Julius (“Groucho”, 1890-1977), Milton (“Gummo”, 1892-1977), and Herbert (“Zeppo”, 1901-1979). Both of their parents seem to have been creative types as well. Their father Sam (a.k.a. “Frenchie”) was a famously bad tailor who lost every customer he ever had. Their mother Minnie was also a crackpot—the kind of a woman who would show for a weekly card game wearing a wig, then take it off when her head got too hot. They seem to have been indulgent, almost negligent, parents, letting the kids run wild around the neighborhood getting into whatever trouble they pleased, with mild rebukes at best as punishment. Leo, the oldest, was the biggest criminal, venturing just about as far into crime as it is possible for a child to go: running with gangs, hanging out in pool rooms, shooting craps, getting in fights, and – worst of all – hocking family belongings to underwrite his growing gambling habit. Adolph was the worst student, but both had dropped out by their teenage years. The salvation of the family was Julius. a studious boy, who spent all his time reading books. Instead of frittering away his time in hijinks, he devised a future for himself. He was still a Marx, of course; he was hardly thinking of enrolling in business school. Inspired by his uncle Al Shean, the successful vaudevillian, Julius thought he would like to go into show business. Minnie was supportive. The role of stage mother and manager suited her. Julius found work immediately, singing in a group called the Leroy Trio. The experience was bad and unfortunately typical of vaudeville. His two partners abandoned him in Cripple Creek, Colorado, absconding with all the money. Julius had to take a job delivering groceries in a horse-drawn cart until his mother could wire him the train fare home. His second experience was equally bad. He traveled with a young Englishwoman in an act called “Lily Seville and master Marx – the Lady and the Tiger”. Lily ran off with Professor Renaldo, the animal trainer, stealing Julius’ share of the take and leaving him the lurch once again. Things looked brighter when he got a job with Gus Edwards’ “Postal Telegraph Boys, and then toured with a legit play “Man of her Choice” for several months. 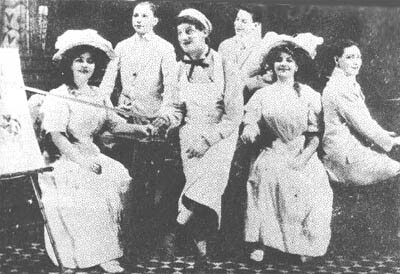 In 1907, Julius and Milton attended vaudeville impresario Ned Wayburn’s College of Vaudeville. under Wayburn’s direction they formed a singing trio called “Wayburn’s Nightingales”, consisting of the two brothers and a classmate named Mabel O’Donnell. Upon leaving Wayburn’s they became simply The Three Nightingales, with Minnie taking overt the management and replacing Mabel with a boy named Lou Levy. When she learned a certain booker needed a quarter she drafted Adolph, who could not sing and was then, like Leo, earning his living playing piano in nickelodeons and saloons (the only legal skill either of them possessed). The Four Nightingales were then joined for a time by Minnie and her sister and they were called “the Six Mascots.” Minnie and her sister at that time were in their 50s—an exceedingly eccentric impulse on their parts. The act, in all its incarnations, was no doubt horrible. They spent several years as singers, yet listen to Groucho sing in any of their films—the man couldn’t sing on pitch or in key if his life depended on it. It’s hardly likely that he could do so when he was younger. Gradually, their comic impulses began to take over. In one performance, the four Nightingales stopped singing in order to chase a bug around stage. At a gig in Nacogdoches, Texas, the boys were hopping mad at the audience when they vacated en mass to go look at a runaway mule. When the audience filtered back in, the Marx Brothers let them have it, with their full barrage of insulting insanity, paving the way for what was to become the whole gist of their act. From 1908-1912 Leo was developing along a parallel track. Somewhere along the line he had become a dialect comedian, making him the first Marx Brother to discover his famous character. He did his “Italian” shtick with a chap named Arthur Gordon (who was later to marry Nora Bayes) when Gordon and Marx disbanded, Leo briefly went solo, then teamed with Lou Shean, Al’s brother. Teacher: What is the shape of the world? Teacher: Well, what shape are my cufflinks? Teacher: Not my weekday cufflinks, the ones I wear on Sundays. Teacher: All right, what is the shape of the world? Patsy: Square on weekdays, round on Sundays! In 1912, Leo was in an act with a gentleman named George Lee. 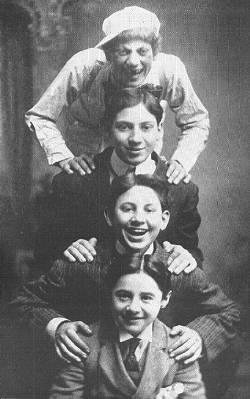 One day Leo showed up at a Marx Brothers performance unannounced and started playing the piano in character. The brothers started throwing fruit at each other and the rest is history. Both Leonard and Lee joined the Marx Brothers act, although Lee himself would soon be “history”. In addition to Leonard’s trick piano playing, the act also now had interludes on Adolph’s harp, which he had inherited from his grandmother. The piano and harp interludes were to remain a staple of their act for the rest of their careers in show business. Unlike later film critics, vaudeville reviewers critics all seemed to love these instrumental numbers, which gave variety, originality and a bit of class to their act. 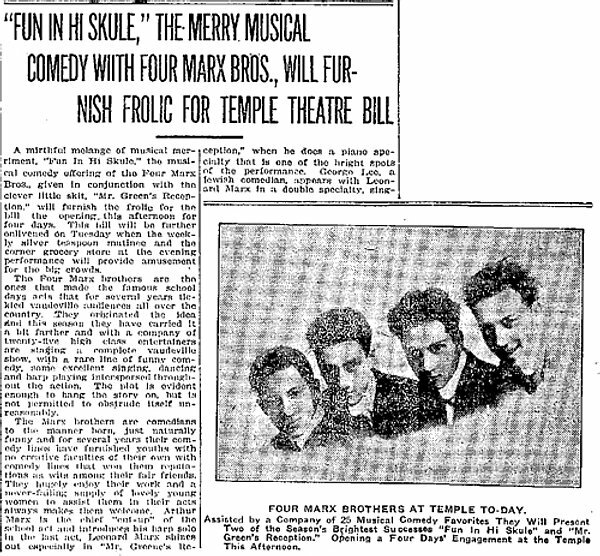 In 1912, they added a second act to “Fun in Hi Skule” consisting of a tenth year reunion of the “Hi Skool” characters. The new act had a cast of 21 performers and toured the Pantages circuit for 46 weeks, garnering rave reviews along the way. Their next sketch was called “Home Again”. It was significant for being the first sketch in which Adoph’s Patsy Brannagan dialogue was replaced entirely by pantomime. Harpo’s famous bit of dropping an endless shower of stolen silverware from his overcoat dates from this sketch. The name “Harpo” also originates from this time, as do all of the brothers nicknames. During a backstage poker game, monologist Art Fisher whimsically renamed them as he dealt them their cards. The “O”s came from a popular comic strip called “Sherlocko the Monk”. Groucho, because of his everpresent concern for his grouch bag, the little pouch where vaudevillians always kept their money. (such concern on Groucho’s part would be understandable considering his first two experiences in show business.). Chico, was first named “Chicko” because of his success with the ladies. Gummo was so named fro his gum-souled dancing shoes. No one is quite sure how Zeppo got named, but it may have had something to do with the German zeppelins then menacing England. The First World War had many great repercussions for the act. First, the 1915 sinking of the Lusitania brought anti-German sentiment in the U.S. to a fever pitch, so Groucho had to drop his Dutch character, gradually replacing him with wise-cracking charlatan we all know today. In 1918, Gummo was drafted, and was replaced by Zeppo. Upon his discharge, they might well have been the five Marx Brothers (as they were on one historic occasion in Flint, Michigan,) but Gummo, who was self-conscious about his stuttering, decided to stay out, becoming an agent and later a manufacturer. The four Marx Brothers were now Big time and were about to become bigger time, thanks largely to the influence of Chico (of all people) who gradually began to replace Minnie as the team’s manager. this only comes as a surprise because of their screen relationships, where Groucho would seem to be the leader. offstage, Chico was the oldest and most persuasive, with producers, backers and bookers. though he could not hold on to money himself, he was a good negotiator, who no doubt taught a trick or two to Gummo and Zeppo, who would later becomes successful Hollywood agents. The group continued to expand. In 1917 they played the Palace. In 1918 they essayed a revue called “The Street Cinderella” but the influenza epidemic kept people away. 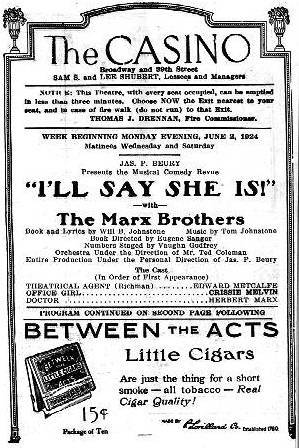 In 1919 they were back in vaudeville doing an act called the Marx Brothers Revue (later renamed “N’Everything”) at the Palace Theatre, Chicago. Hammer: (on telephone) Hello, Gumchewer, give me two wrong numbers, then give me the Musicians’ Union. “Union”, u-n-un. Hello, une. Say, have you got a couple of men who are out of work? Oh, it’s a union. Well, send me a couple of men that look like me. What do I look like? Did you ever see Lincoln without a beard? Well, I look like Washington with a mustache. In 1922, they toured England, a move that was doubly disastrous. First, the Brits did not get the team’s humor at all, and so they had to return to the States with their tails between their legs. Upon their return they learned that, because hadn’t cleared the English tour with the Keith-Albee organization, they were now blacklisted from the big time. Next, inspired by the fortunes earned by their former contemporaries Chaplin and Keaton, they decided to try to break into films. Their self-financed result Humor Risk was an unmitigated catastrophe which was withdrawn after one showing. Two follow-up vehicles to I’ll Say She Is were written by George S. Kaufman and Morris Ryskind: The Cocoanuts (1925-28) with music by Irving Berlin, and Animal Crackers (1928-30) with songs by Kalmar and Ruby, including the classics “Hello, I Must Be Going” and “Hooray for Captain Spalding,” which was to become Groucho’s theme song. These hit Broadway shows were to let to their movie career; the subject for our subsequent post. To find out more about the Marx Brothers and the history of vaudeville, consult No Applause, Just Throw Money: The Book That Made Vaudeville Famous, available at Amazon, Barnes and Noble, and wherever nutty books are sold.